The Caribbean nation of Suriname may be one of the most forested countries in the world, with some 93 percent of the country’s surface area being covered in forests, but it is also the most threatened as it struggles with the impacts of climate change. Suriname, which has a population of just over half a million, holds its forests as “a central component of its economic, social and cultural life,” according to REDD +. 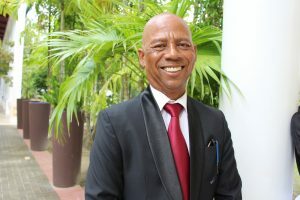 Winston Lackin, Ambassador for the Environment for Suriname, told IPS that developed countries need to step up and have a conversation with countries like his, as they are experiencing the brunt of climate change impact while their own greenhouse gas emissions are negligible. Lackin spoke to IPS on the sidelines of a major international conference on climate financing for High Forest Cover and Low Deforestation (HFLD) countries, which Suriname is hosting. “So, if business as usual continues in the industrial world we will face serious problems even when we are maintaining our forests. But we took the decision that the forest, the environment is in the first place our responsibility. It’s our life, it’s our survival. So, that’s why we commit ourselves to that,” he said. The objectives of the conference are to strengthen cooperation, collaboration and exchange of knowledge and experience among HFLD countries. It also aims to develop joint strategies and positions to help HFLD countries maintain their intact forests and preserve forest cover, and make international communities more aware of the significant global importance these countries and their productive landscapes play in combating climate change. Inter Press Service (IPS): What issues, if any, do you have with the Paris Climate Agreement and its link to forests? Winston Lackin (WL): The Paris Agreement is focusing, in our view, too much on mitigation for HFLD countries. We are not part of that. We are a carbon negative country. So, we feel that the focus of the Paris Agreement is too much on mitigation and less on adaptation. Adaptation is our issue because adaptation would guarantee us that the lands are okay, that we can continue with agriculture. We should do smart agriculture, there are technologies for that, but adaptation is our real challenge. Since, for example, we are a continental country we’re not in the group of the SIDS [Small Island Developing Nations] but still we have challenges when it comes to adaptation. We feel that the Paris Agreement should focus a little bit more on adaptation and direct more finance to adaptation in our specific case, which is the case for most of the HFLD countries. IPS: So, what are the specific challenges faced by your country as a result of climate change? WL: The first one that we are facing is access to finance. What we are seeing happening as a result of climate change in certain parts of Suriname, especially the western part, we see the line where salted water was in the beginning, it’s moving further. So, the very important productive area where we have our rice and banana crops, is in danger. We’ve seen that in the interior of Suriname where our indigenous people have their crops, problems with the soil—it is too dry, or they have flooding. They are having serious problems in guaranteeing the food supply. So, we see this affecting directly our people and their environment. What we are trying to do all the time is to get access to climate finance, but it has been very difficult, too complicated. They have classified us as one of the middle-income countries, which creates more problems for us to get access to concessional loans. That’s why we thought [that it is] time that we have a new kind of discussion. We are contributing to the mitigation of the negative effects of climate change, which are not caused by us and still when we look at our social, economic development that we have to guarantee people, we cannot meet our obligations because of a lack of finance. The money that we don’t have for agriculture, education and health; we are forced now to put into coastal defence. We don’t feel that this is right. We have a feeling that we are being punished by behaving well, so we want to change that. IPS: What role should the developed countries play in assisting your country and also the SIDS? WL: The message we are bringing is that if I am helping you by making sure that my forests . . . are contributing to mitigation of the negative effects, now it’s time for you to help me take care of my sustainable development and make sure that what I need comes to me. I’m helping you, it’s time for you to help me in a different way. We feel that there is too much red tape for countries like Suriname to get finance – the resources we need. And we are feeling the results of the actions which incidentally are not taken by us. We are not part of the making of that. IPS: Are the HFLD countries speaking with one voice or is there need for a more unified approach? WL: That is one of the things that we are looking at this conference. And I am happy about the reaction that we received [assurance] from the director of the UNFCCC [United Nations Framework Convention on Climate Change] Patricia Espinosa that the outcome of this conference will be part of next steps discussions in the international fora when it comes to the environment. We feel that the HFLD countries deserve another kind of treatment because of the role they are playing. We are looking also to connect more with the Coalition for Rainforest Nations to create a platform within the structure of the United Nations that when these issues are discussed that we are there in a group. There are 33 HFLD developing countries where like 24 percent of forests in the world is located in these countries. So, the contribution that we are making is enormous and it is time that we have a louder voice; that we join forces, that we have these durable partnerships to call the attention of the world to access to finance for the challenges that the HFLD developing countries are facing.